The Costa Forest Reef 310 prescription eyeglasses have the casual look that will never go out of style. With its rounded edges made of Acetate and Monel, not only will you stand out with them on, but they provide a lightweight fit that can be worn all day. 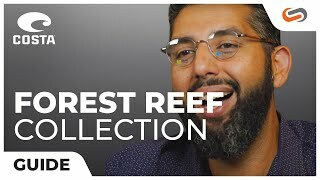 All the colorways for the Costa Forest Reef 310 eyeglasses were inspired by ancient underwater forests in the Gulf of Mexico. Make sure to get your prescription Costa Forest Reef 310 eyeglasses from SportRx today.